Oracle Open World 2017: 9 Announcements to Follow From Autonomous to AI | Constellation Research Inc. Whether Oracle’s claims are fair and accurate remains to be seen, as the first release of the Oracle Autonomous Database, through a Data Warehouse Cloud Service, won’t be available until December. Count on it being at least a few more months before independent reviewers can do independent tests against rival cloud services. As for those tests results, the comparison of Oracle Database on Oracle Cloud vs. Oracle Database on Amazon is a shoe-in for the home team given Oracle’s ability to run the database on Exadata, which is not an option for Amazon and which which pushes down query processing to the storage layer, thereby reducing the load before the query even gets to the database engine. Oracle DB on Exadata vs. Redshift on Amazon is more of an apples to apples comparison. Here’s where I’m eager to see independent test results. Generally available today are Next Best Offers and Recommendations, a subset of Adaptive Intelligent experiences coming to the Customer Experience (CX) Cloud. Following the roadmap laid out last year, Oracle announced Adaptive Intelligent Apps for HR, ERP and Supply Chain Management at OOW17, but nobody was predicting release dates for this next wave of smart apps. Oracle is in some cases keeping up and in some cases catching up with the market on big data and artificial intelligence. This summer Oracle announced the Oracle Big Data Cloud, which is a big data platform based on Hadoop and Spark and closely aligned with the ODPi standard also used by Hortonworks, Microsoft and IBM. Oracle’s previous offering, the Big Data Appliance based on Cloudera, is still available both on-premises or as a hosted service. But the future focus is clearly on Oracle Big Data Cloud, which separates storage and compute decisions and offers object storage as a low-cost alternative for high-scale data lakes. To address streaming, real-time applications, Oracle has added the Oracle Event Hub, which is based on open source Apache Kafka, for routing and processing. Oracle Stream Analytics is a rewrite of the company’s complex event processing technology that now runs on Apache Spark. 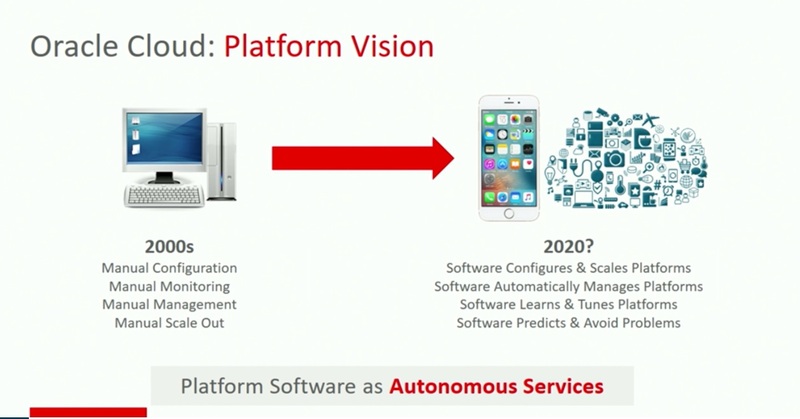 As for the AI & ML PaaS, it was announced at OOW17, but it’s not yet available (as per Oracle’s site). Based on the roadmaps I’ve seen, I’d expect the AI & ML Pass to be available within three to six months. In contrast, AWS, Google Cloud Platform and Microsoft have all had GPU capacity available for some time. On model development and deployment, Microsoft last month introduced the beta preview of its next-generation Azure Machine Learning portfolio, which promises end-to-end model lifecycle management. In short, my take is that Oracle is still catching up on AI cloud services and capabilities. 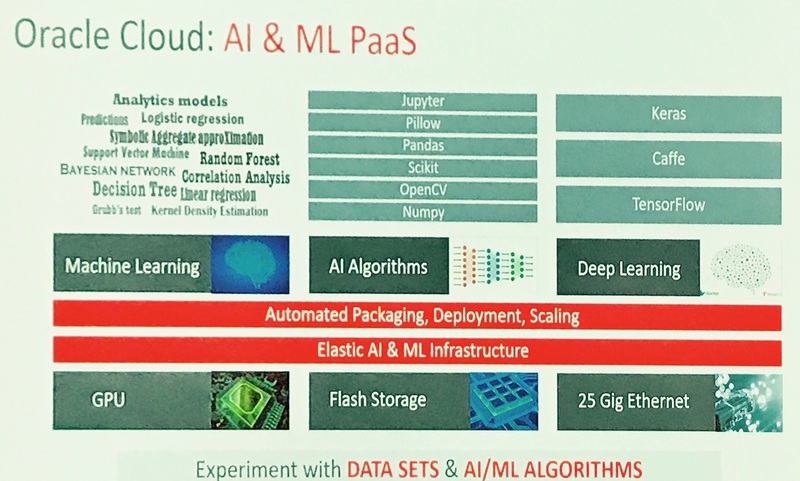 Oracle announced a series of machine-learning and natural-language-processing-based enhancements to the Oracle Analytics Cloud at OOW17 and they’ll be available over the next three to six months. Automated Data Diagnostics is an “Explain” capability that will surface hidden drivers and guide users to data and analyses that they might not otherwise investigate. Natural Language Insights will generate plain-text analyses of salient points on a chart, helping uses to focus on what matters. Improved “Ask” Natural Language Query capabilities will support synonyms and abbreviations and will dynamically correct and reinterpret queries as you type. Oracle is also working on Enhanced Data Catalog capabilities, including search and navigation across metadata and social tags, as well as automated recommendations of related and relevant datasets to promote discovery. Analysis: Oracle Analytics Cloud seems to be on a path that’s similar to Microsoft PowerBI and Azure ML. Both vendors have created comprehensive portfolios and are seeking to leverage the strengths of their respective clouds and data platforms. The updates and enhancements announced at OOW17 mostly match state-of-the art capabilities that are already available in the market. For example, Oracle’s “Explain” feature is akin to Salesforce BeyondCore and a similar feature embedded in Microsoft PowerBI. Natural Language Insights is akin to Narrative Sciences and Automated Insights capabilities that Qlik and Tableau have both leveraged. State-of-the-art natural language query is available from multiple vendors, including Microsoft, IBM (Watson Analytics) and others.